Hiring an SEO expert, whether that’s a full-time in-house SEO or an external agency or freelancer, for your online business is not a decision to be taken lightly. This guide offers a few pointers to make the decision of who to hire a little easier and avoid a raw deal. 4 What do SEOs charge? 5 Do they offer guarantees? 6 Can you pay someone on results? If you’re a small business owner you don’t always have the option of hiring a freelancer to manage your website and SEO. Often you don’t have the funds to hire an in-house team either. As a result, you can end up having to do your own SEO for your business. However, if you are in a position to choose either one, you should know that you can get great results, whether you do this in-house or hire an external team. Some smaller start-ups and entrepreneurs don’t have the money available to hire someone – either as an external support or an in-house employee – so they end up doing it themselves. This is where it can become tricky. If you do know about SEO and have the background to support it, you’ll be able to slowly but surely get your business to rank better and optimise your business online. But it may take some time, as you have to do it alone. At the same time, you have to spend time on your business too. Once you’ve established this, you can decide what option will work for you. If you have the budget available, hiring a dedicated in-house SEO consultant is often the best choice. They will work on your business full-time and dedicate all their time and resources to your business. If budget is an issue, try to hire an SEO professional on a part-time basis to start with. This way you can focus on your own business and working with customers. You can gradually move to a more full-time commitment as your business grows. Only try to do your own SEO when you really don’t have a budget available to hire someone else. It takes a lot of time and effort to handle, and it’s an on-going process that never stops. Achieving great rankings is awesome – but keeping them is just as challenging to do. Many businesses choose to hire a full-time in-house SEO expert to handle all their SEO needs. They only focus on optimising your website and improving its rankings. The upside to this is that you can start seeing results almost immediately. This gives you a great return on your investment. If you hire a full-time SEO they will be able to have an expert on your team with good knowledge of your products or services. The only negative is that this will cost you significantly more, and requires a long-term commitment. You can expect to pay a full-time SEO around £30,000 per year, but you’ll get an expert for this, as there are more people available than there are positions open. You should interview a few people to find the best possible match for your business needs. You can also choose to hire an SEO in-house, on a part-time basis. This will be more affordable, but the person may not have as much in-depth knowledge about your business. However, it’s a good option if you don’t have the money to hire someone full-time. Hiring someone on a part-time basis may still be a better option than having to do your own SEO as you need to spend time on other areas of your business. Keep in mind that when you hire someone on a part-time basis it may take longer to see results as they will spend less time on your optimization than someone working full-time. If you do have the budget available, a freelance SEO consultant is a useful string to your bow. They can amplify what your internal team are capable of, or work on their own to improve the major areas that need optimising. A search engine optimisation (SEO) consultant is a freelancer that helps online businesses rank higher in search engines. They have an in-depth understanding of the digital landscape and provide guidance and services that improve online visibility so your website will be indexed against search terms. These SEO professionals can be hired on an hourly, monthly or one-time fee. They focus only on SEO so you should see results almost immediately. They can compete for competitive keywords in your industry and you are not required to commit on a long-term basis. When you work with an outside SEO professional or team, they have all the knowledge necessary. But they won’t automatically know your business. That’s the only downside. It might take some time for them to get to know your business inside and out – making it slightly more challenging. The benefit is that they do SEO every day, so they are experienced and know exactly how to best optimise your website and campaigns. So the rate you pay for their expertise will be worthwhile. The cost of SEOs can vary widely depending on how much you need doing. If you have a large website with a lot of pages, the initial stages will be more expensive as there is more work to do. There are typically four pricing models; hourly, project-centered, monthly retainer or packages. SEO consultants typically charge clients an hourly rate of £30-£35 in the UK and all other models and packages are based on the hourly rate. Experienced SEO consultants that have a solid reputation and target high-end businesses charge substantially more for providing the same service. Packages are usually the most popular as you know exactly what you are getting for the price you are paying. If it takes an SEO consultant more than the allotted time to complete their tasks, you shouldn’t be charged extra as the service is included in the cost. The only guarantee in search engine optimisation is there are no guarantees. That is not always due to the incompetence of an SEO practitioner, but because the digital landscape and search engine algorithms can change at any time. It can be the case that the strategies employed are suddenly out-of-date and penalised. Having said that, SEO consultants that have a good understanding of SEO algorithms and have a vision of the digital evolution will avoid search engine penalties. Their strategies may take longer to get results, but there is a higher chance of maintaining a good rank over the long-term. Online businesses that have risen too quickly fall a lot quicker and are put at risk as a consequence. Furthermore, the best SEO consultants are reluctant to offer guarantees even if they are confident their strategies work. The simple reason for this is because SEO agencies that spam inboxes usually attempt to entice prospects with promises like “Rank #1 Google”. Guarantees make SEO consultants sound untrustworthy rather than credible. Can you pay someone on results? It is highly unlikely for SEOs to offer results-based payments. These people are freelancers, usually one-man teams with a few contacts that rely on regular payments from their clients to make a living. SEO, when performed properly, can take around six months before you start seeing significant results. In highly competitive industries, this could be closer to 12 months. SEO consultants simply cannot afford to wait this long to get paid. For this reason, some SEO consultants tie clients into 12-month retainers. Avoid these traps. You want to work with SEO consultants that can be flexible with their strategies and your budget, particularly if you need to bail on on financial grounds. SEO is a long-term investment. Therefore, when hiring an SEO consultant you have to put your faith in them and trust their judgment. It is advisable to do some research online and get clued up about the latest trends and strategies beforehand. There are plenty of up-to-date resources online that reveal the current status of the digital landscape. Don’t attend an SEO seminar and expect the speaker to give you up-to-date information to work with. It’s important to make sure you hire an SEO who knows what they are doing. Before you hire anyone, make sure you give them a thorough vetting! Link building is a key component to building links. Years ago, SEO firms were manipulating search results by creating link farms. As a result, links from low-quality websites are now penalised by search engines. Ironically, reputable magazines are now being used as link farms and charge extortionate prices to publish content on their platforms. Ideally, you want to work with SEO professionals that publish content on influencer websites that are relevant to your business rather than alternative “newspaper” platforms that publish a wide range of suspect content. You also want to hear SEOs talking about internal link building practices that promote your key product pages and target keywords. Internal link building is essential for site navigation and the best SEOs will know how to do this. Can they show proof of previous results? Have they had experience in your industry? What tactics have they seen working in your industry? Can they give you a brief overview of their approach? Are they up-to-date with the latest algorithm and what is their strategy? When do they really expect to start seeing results? Do you demand a monthly retainer? Do they send reports, and if so, how often? Do they offer flexible packages? Do they work with 3rd party contractors? How often do they perform SEO audits? The toss up between SEO freelancers and SEO agencies is also a tough call. Agencies have more staff and can turn results around quicker than SEO consultants. Having said that, the service provided by agencies is typically standard SEO practices performed by salaried staff members that may not keep in touch with the latest trends. SEO consultants typically have more knowledge than agency employees, Because they have more at stake, make time to stay on top of a fast-changing industry. Unless you have a budget of £2000+ you will get more value for money from an SEO consultant. The working relationship with SEO consultants is also generally tighter. SEO agencies have teams that cannot monopolise decision making. SEO consultants include clients and advise them on the best strategy. The reason for this may be because you are expected to perform some digital marketing practices in-house – but purely on the grounds that you know your business better than anybody. If you are pressed for time, an agency may be a better option, but you could also end up paying for services that do not produce results because agency staff does not understand your business sufficiently. A big part of SEO is engaging customers and building trust. You can’t expect to do that effectively by using external sources. Be wary of any practitioners in the SEO industry that say they will manage customer engagement for you. Finding the right SEO consultant (or agency) to hire can be a complicated process. But now you know the signposts to look out for, it will be easier for you to steer your decision towards the SEO professional that you feel is the best fit for your company. Maile Ohye works with Gooogle Search – here she shares advice on how to hire a useful SEO expert and prevent hiring a bad one. SEO stands for search engine optimisation. To some, SEO seems like black magic. Having worked with Google search for over a decade what I’ve learned is that first it’s not black magic, and second if you want long term success there aren’t any quick magical tricks that an SEO will provide so that your site ranks number one. It’s important to note that an SEO’s potential is only as high as the quality of your business or website. So, successful SEO helps your website put your best foot forward so that it ranks appropriately in the spot where an unbiased potential customer would expect your site to be seen. A successful SEO also looks to improve the entire searcher experience from search results, to clicking on your website and potentially converting. A good SEO will recommend best practices for a search friendly site. From basic things like descriptive page titles for a blog for small businesses, to more complex things like language markup for a multilingual global site. SEO’s ensure that you’re serving your online visitors with a good experience, especially those coming from a search engine, and that your site is helpful, whether they’re using a desktop computer or mobile phone. In most cases, the SEO will need four months to a year to help your business first implement improvements and then see the potential benefit. The SEO’s description of the issue that needs to be improved to help with ranking. The approach they prescribe to accomplishing this task. Requesting these two bits of information will help prevent hiring a poor SEO who might otherwise convince you to do useless things like add more words to the keywords meta tag or buy more links. Because if you search for Google advice on this topic, you’ll see blog posts and video tutorials from us that clearly explain that adding keywords to the meta tag wouldn’t help. Furthermore, while Google uses links for rank, our documentation highlights that we strongly advise against the approach of buying links for the purpose of increasing page rank. One basic rule is that in a majority of cases doing what’s good for SEO is also doing what’s good for your online customers. Things like, having a mobile friendly website, good navigation, and building a great brand. Additionally, if you’re a more established brand with complicated legacy systems then good search friendly best practices likely involves paying off some of your site’s technical debt, such as updating your infrastructure so that your website is agile and able to implement features faster in the long term. If you own a small local business, you can probably do the initial work yourself. Check out our 30 minute series on how to build a local presence for your business. Let’s break this down and start with step one – conduct a two-way interview. In the interview. Here are some things to look for. A good SEO doesn’t focus only on search engine ranking, but how they can help your business. What makes your business, content, and/or service unique and therefore valuable to customers? They want to know this information to make sure it’s highlighted on your website for your current and potential new audience. Who are your competitors? What do they do well online (and potentially offline)? If the SEO doesn’t seem interested in learning about your business from a holistic standpoint, look elsewhere. It’s difficult to do good SEO without knowing about a business’s goals, their customers, and other existing marketing efforts. SEO should complement your existing work. The second step in hiring an SEO is to check their references. If your potential SEO provides prior clients, be sure to check their references. You want to hear from past clients that the SEO was able to provide useful guidance and worked effectively with their developers, designers, UX researchers, and marketers. A good SEO should feel like someone you can work with, learn from, experiment with, who genuinely cares about you and your business, and not just getting your site the highest rank as ultimately those techniques rarely last long, if they work at all. They’ll want to educate you and your staff on how search engines work so that SEO becomes a part of your general business operations. Step three is to request a technical and search audit. If you trust your SEO candidate, give them restricted view, not full or write access, to your Google Search Console data, and even your Google Analytics data. Before they actually modify anything on your website, have them conduct and technical and search audit to give you a prioritised list of what they think should be improved for SEO. If you’re a larger business, you can hire multiple SEOs to run audits and prioritise improvements. See what each has to say, and then determine who you could work with the best. An estimate of the overall investment. In other words, the time, energy, or money it would take for your developers to implement the improvement and for Google search, as well as searchers and customers, to recognise the improvement. The SEO will need to talk with your developers to better understand what technical constraints may exist. The estimated positive business impact. The impact might be a ranking improvement that will lead to more visitors and conversions. Or perhaps the positive impact comes from a back end change that cleans up your site and helps your brand be more agile in the future. A plan of how to iterate and improve on the implementation. Or perhaps, how to experiment and fail fast should your results not meet expectations. That covers the structure of a technical and search audit. Now let’s talk about each of these audits individually. If they mention that your site has duplicate content problems that need to be corrected, make sure they show you the specific URLs that are competing for the same query or that they explain that it should be cleaned up for long term site health, not initial growth. I mention this because lots of duplicate content exists on websites and often it’s not a pressing problem. In the search audit, your potential SEO will likely break down your search queries into categories like branded and unbranded terms. Branded terms are those with your business or website’s name e.g. a search for ‘Gmail’ is a branded term, while the search for ’email’ is an unbranded or general keyword. An SEO should make sure that for branded queries, such as Gmail, your website is providing a great experience that allows customers who know your brand or website to easily find exactly what they need and potentially convert. They might recommend improvements that help the entire searcher experience, from what the searcher sees in search results, to when they click on a result and use your website. For unbranded queries, an SEO can help you make better sense of the online competitive landscape. They can tell you things like here are the types of queries it would make sense for your business to rank, but here is what your competition has done and why I think they rank where they do. Update obsolete content. They might say, your site is suffering because some of your well ranking content is obsolete, has poor page navigation, has a useless page title, or isn’t mobile friendly. Let’s improve these pages and see if more website visitors convert and purchase, or if they can micro convert meaning perhaps that they subscribe or share content. Improve internal linking. Your SEO might say, your site is suffering because some of your best articles are too far from the homepage and users would have a hard time finding it. We can better internally link to your content to feature it more prominently. Generate buzz. The SEO might say, you have great content but not enough people know. We can try to get more user interaction and generate buzz, perhaps through social media or business relationships. This will help us attract more potential customers and perhaps gain more natural links to your site. Learn from the competition. Your SEO might explain, here’s what your competitors do well. Can you reach parity with this and potentially surpass them in utilities? Or can you better show customers your business’s unique value? Again, a good SEO will try to prioritise what ideas can bring your business the most improvement for the least investment and what improvements may take more time but help growth in the long term. Once they talk with you and other members of your team, such as developers or marketers, they’ll help your business forge a path ahead. The last thing I want to mention is that, when I talk with SEOs, one of the biggest holdups to improving a website isn’t their recommendations, but it’s the business making time to implement their ideas. If you’re not ready to commit to making SEO improvements, while getting an SEO audit may be helpful, make sure that your entire organisation is on board. Or else your SEO improvements may be non-existent, regardless of who you hire. With so many SEO services available, many promising different, exciting things, it can be hard picking which one to go with. 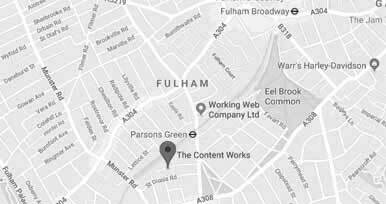 Here at The Content Works, a specialist website auditing company, we often pick up the pieces of a rogue SEO outfit doing things in a really bad way. Unfortunately, if it looks too good to be true, chances are that it is. Here’s our list of 6 SEO service red flags to watch out for. 1. They guarantee lots of backlinks for a cheap price. Backlinks can be a very effective part of an SEO strategy, but they are not easy to earn. To prove your worth to another high quality website to the point where they decide to link to you takes time and effort. So, if a SEO agency promises you that they can get you lots of backlinks quickly and cheaply, whilst this may seem tempting, it’s highly suspicious. Most likely they would only be able to do this through black hat SEO practices, such as purchasing lots of cheap spam links from backlink farms, which will likely get your site penalised by Google. This is connected to point one, but still stands to be stated – if the agency is promising to give you results for a cheap price, this is likely going to harm your website in the long term. Take the average SEO’s hourly rate of £40/hour and then look at your quote. Work out how many hours are going in to the job you’re being quoted for. This is because creating quality SEO strategies – from quality backlinks to quality content, to thorough analysis of your website – costs more money. The agencies that promise to do the job for cheap prices are most likely cutting corners, and it isn’t worth the penalty risk going ahead with them. 3. They promise quick turnaround. As you’ve probably gathered from the earlier points, SEO is a long-haul, ongoing process. As much you’d like to see changes happen quickly, if you want to do a good SEO job, the results are going to take some time to take effect. Things like creating good, tailored content not only takes more time, but takes time to be registered and noticed! If an SEO service promises results quick, they may deliver in the short-term through blackhat methods. But in the long term, this will actually have a damaging effect to your website’s reputation, so is not worth pursuing. 4. They don’t request access to your website to make changes. Whilst you may be hesitant to hand over control (or partial control, anyhow) of your website to an outside team, if the SEO agency you are looking at tells you they don’t need to make any changes to your website directly, this is actually rather fishy. On-site SEO – which can include everything from creating fresh, keyword-related content, to uploading optimised images, to improving site navigation – is an important part of any SEO strategy. To do this, they will need access to your Content Management System, Google Analytics and Search Console data (to determine what changes need to be made in the first place), and perhaps even other details such as access to your social media accounts. Without these, it is unlikely the SEO agency will be doing a thorough job for you – they are likely just adding toxic backlinks which will, as discussed above, harm you in the long term. 5. They refuse to explain their practices. SEO can get complex at times, and the type of work being done to your site may be varied. But if the SEO service is being mysterious about their practices to the point where they won’t disclose a basic understanding of how they go about their job, this is a pretty big red flag. 6. Guaranteeing you will rank number one in Google. The final, and perhaps most common red flag is the elusive promise that you will rank number one in Google. This sounds like the dream, right? But it’s not quite as straightforward as it sounds. The reason is that nobody knows Google’s full algorithm, and even if they knew it now, nobody knows how it will change in the future – so without this full knowledge, guaranteeing a number one ranking is pretty…ambitious, let’s say. Alternatively, the SEO service may in fact be able to rank you at the top of Google search results…because the search result is so rare to begin with. For example, if you run a pet grooming service, they may be able to rank you first for ‘how to get dog fur out of a brush without any expensive or professional tools’ – but that is because so few people are searching for this to begin with! This means that even if you land as the first result for this keyword (keywords can be defined as phrases as well), it would not add much to your web traffic. So ranking number one is not always all it seems – be wary of those who claim they can guarantee you a place there. We’re an SEO consultancy specialising in techincal website and SEO audits. Find out how our SEO consultancy package can help you improve your website and ensure it’s working as you need it to. Call us on the number below.